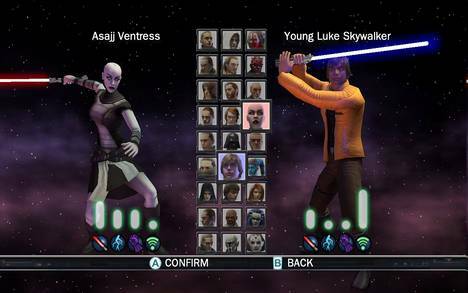 So, as you read earlier, Dyson and I got to preview Star Wars: The Force Unleashed for every platform. The game is going to be relatively similar for each platform, with a few notable differences here and there. The most evident variations are in the Wii version, and there are a couple of things that really set it apart from the other versions. Obviously, the Wiimote motion sensing is the main difference, but there's one other thing that the Wii version has that the Xbox 360 and PS3 won't have: a versus mode. *Waves hand* You will click the "read more" button for my preview of the Wii version of Star Wars: The Force Unleashed. The story, as you would expect, is completely the same as the Xbox 360 and PS3 versions. 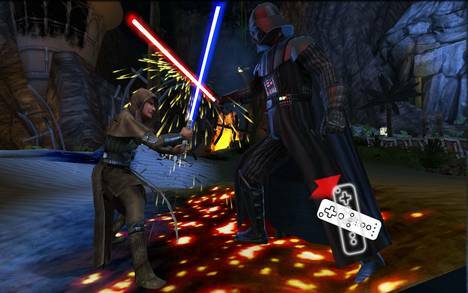 The game will start you off as Darth Vader as he hunts down a Jedi on the Wookiee home world. After the first level, you'll become the Apprentice, doing whatever your Master (Darth Vader) commands of you. Now, the story may be the same, but everything is presented differently here. With the Wii version, we started off on the second level as the Apprentice, who was on a mission to an Empire ship factory to take on the Rebels and a Jedi -- just like on the Xbox 360 version. 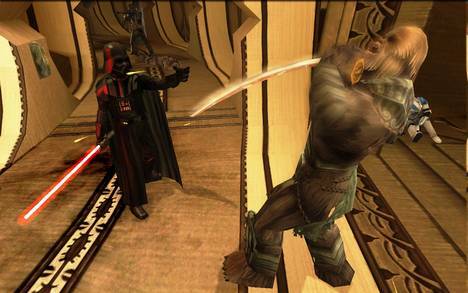 In the cut scene that introduced this mission, however, the Apprentice and other key characters were in different positions and locations as the story was unfolding. The difference also applies to the level design. We're in the same location that we played through on the PS3 and 360 versions, but the designs were completely different on this level. Everything felt more close-quarters and there weren't as many enemies on-screen at the same time. The Wii version isn't being handled by the same team working on the higher up consoles, so things like the Euphoria and DMM engines aren't actually in the Wii version. There is a system in place, though, that mimics these engines as best it can -- so you will see things like realistic ragdoll effects. Control-wise, you use the analog stick to move the Apprentice and you swing the Wiimote to slash with your lightsaber. The Wiimote/Saber has five standard motions with it, and yes, the Wiimote speakers make the proper lightsaber noises when swung around. The Nunchuk's motion sensing feature is used for your Force powers. Push the Nunchuk forward and you'll use your Force push. You'll use both controllers in conjunction to perform certain moves such as the Force Repulse, which has you moving both controllers down towards the ground and will have the Apprentice blast away everything that's near him. Pressing the Z button will pick up objects and people, and to move them around, you'll use the analog stick. When you have enemies up in the air, you can perform combo attacks, such as throwing your lightsaber into an enemy and shocking them with lightning bolts, to plenty more. There are also gun turrets scattered throughout the levels, which are only on the Wii version. When you come across them, use your Force powers to grab the turret. Once grabbed, they will hover near you for a short period of time and automatically target any enemies, saving you the trouble. I can go on, but Dyson more or less covered what you needed to know about the single-player experience. One last thing to note, though, is that you will have the ability to customize the Apprentice, just like in the other versions, by killing enemies and collecting Force Points. 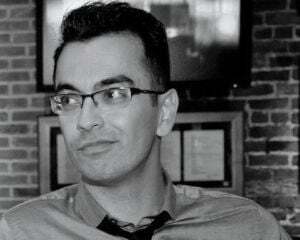 Now, time to talk about the multiplayer. The Wii version is the only console Unleashed title to have the "Duel Mode," and it's only going to be local versus. I think the best comparison to Duel Mode would be Power Stone. The arenas are similar as they're a large open space and the fighters have crazy powers with the ability to go into a super strength mode. To start off, you'll have 27 characters to choose from. The characters come from Unleashed, the Star Wars movies and the Star Wars Expanded Universe. You'll be able to pick from Darth Vader, Luke Skywalker, Darth Maul and plenty of other iconic characters. Oddly enough, there is no Yoda here. When I asked why there was no Yoda, I was simply told that he's "too small." Well, that makes total sense, as he would be a very cheap character and including him in any kind of a fighting game would ... be ... unfair ... oh wait. 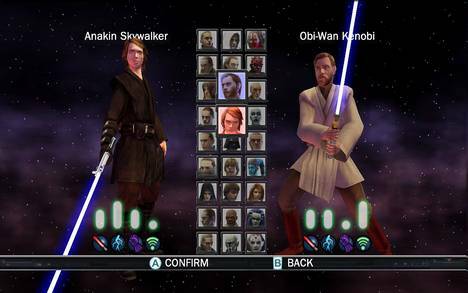 Once you've picked your character, you get to choose between one of nine stages ranging from various Star Wars locations. I picked Darth Maul, and Dyson played as Luke Skywalker [Update: I originally said Dyson picked Han Solo. I always get the two confused, my bad! ], which probably says a lot of our own personalities, but I digress. Every character has only one lightsaber, so even though Darth Maul should have the double Saber, he was limited to just one. The levels are pretty big and you can almost go wherever you want to. The camera will prevent you from going too far away from your enemy, so even though the levels are big, both players can't actually be too far away from each other. The match type we played in was a simple first to three wins type of deal. When a player is killed, they're respawned almost immediately, but neither player can hurt each other for a few seconds. You can run around freely while waiting to attack until you're given the all clear. All of your powers that you will get in the main game are already opened in Duel Mode so it's a matter of who's the quickest to strike. Full Force Powers are available, too, so you can pick up objects on the map to throw at your opponent or even pick up your opponent. As you fight, you'll fill up a meter located near your health bar. Once it's filled up, your character will become "Unleashed" and all of your powers will go into overdrive. All your attacks become stronger and will inflict some serious damage until you run out of juice. 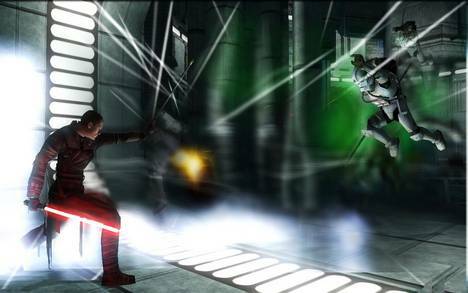 If both players strike at each other with the lightsabers at the same time, a mini-game in the style of God of War takes place. Wiimote and/or Nunchuk icons will appear on the screen in a certain position. This will happen a few times during this Saber lock and the first one to match up each pattern will break the Saber lock and inflict some damage. This will get pretty frantic as you're trying to move your Wiimotes to match the pattern. You have to be perfect, so even moving the controller a bit after matching it up will mess things up. There will be power-ups located on the map as well, ranging from increasing your attack powers or making you invincible, to actually calling in reinforcements such as Storm Troopers who will drop in a small group and blast at your opponent. They aren't invulnerable, though, so you can totally attack these guys. Overall, The Force Unleashed is quite the experience. I found myself laughing a lot throughout the game. Simply picking up Storm Troopers and throwing them at other soldiers is a blast. Plus, picking up other people in the multiplayer is so much fun. One of the levels that Dyson and I played on had a giant pit in the center of the stage. The match on this level quickly turned into a heated battle of who can pick up and throw the other guy into the hole the quickest. I did have some issues with picking objects up and moving them around, but as Dyson noted in his preview, we didn't really have all that much time to fully get used to the system. I'm sure that with time, I could become a Jedi master. The PS2 version will be exactly the same as the Wii version, except for the motion sensing and Duel Mode features. Look for Star Wars: The Force Unleashed to hit sometime this Fall.